Not Business as Usual was the theme of the Long-Term Pavement Performance (LTPP) State Coordinators’ Meeting at the 2013 Transportation Research Board (TRB) Annual Meeting held in Washington, DC. The meeting allowed for an exchange of information between the LTPP program office and State highway agencies. It was attended by LTPP’s State highway agency partners, industry, academia, and consultants. This article provides a synopsis of the discussions and presentations made during this meeting. Jorge Pagán-Ortiz, Federal Highway Administration (FHWA) Director of Infrastructure Research and Development, began his opening remarks by thanking LTPP’s State highway agency partners for supporting the LTPP program for many years and emphasized the theme, Not Business as Usual. He highlighted LTPP’s initiative for developing new experiments and making the LTPP database easy to use. Pagán-Ortiz also talked about the role of research under the new highway legislation, Moving Ahead for Progress in the 21st Century (MAP-21), and how it creates a streamlined performance-based surface transportation program. He emphasized that LTPP must align with the direction of MAP-21 moving forward and said support from State highway agencies is needed to help the program meet the requirements of the new legislation. 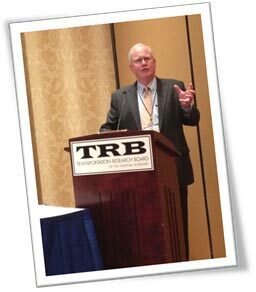 Bill Temple, Chairman of the TRB LTPP Committee and moderator of the session, praised the program for raising the standard for collecting high-quality weigh-in-motion data. 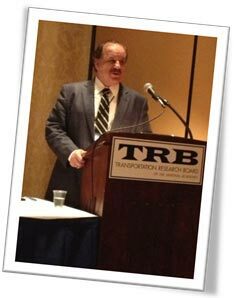 He also commended the article, "The Metamorphosis of Long-Term Pavement Performance Traffic Data," which appeared in the November–December 2011 issue of TR News. He believes LTPP should continue to publicize these types of successes. The Committee is pleased to see LTPP evolving proactively by addressing new experiments and taking steps to enhance the database. Temple said LTPP needs to “strike a balance between adding funds for new experiments and restoring funds previously cut from LTPP’s ongoing activities.” In addition, the Committee still believes that a long-term plan independent of FHWA internal management changes is needed for the LTPP database. Jack Springer of FHWA updates the audience on LTPP’s new monitoring efforts. Over the past few years, LTPP program team members have visited with numerous States and Provinces to reintroduce the program to staff. During these visits, agencies expressed the need to conduct long-term performance monitoring of warm-mix asphalt sections and pavement preservation treatments. LTPP has begun planning for new experiments to address these critical needs. Jack Springer, a member of the LTPP Team, has been involved in these discussions with agencies and is leading this new initiative. Activity is now underway to design the experiment focused on warm-mix asphalt. Monitoring this type of mix design and construction on pavements from the time of placement to the end of performance will confirm how beneficial this relatively new technology is to agencies. Activity is underway to design the experiment and establish recruitment guidelines. Recruitment for new warm-mix asphalt test sections will begin this summer. Yan “Jane” Jiang showcasing what’s next for the LTPP Database. In keeping with the strategic goals of the program, the LTPP database, which is used by pavement professionals worldwide, is undergoing a significant reinvention to make it easier to use. 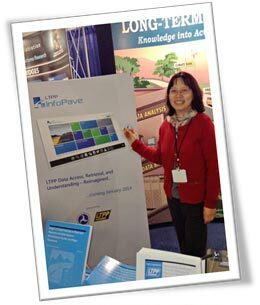 As reported by Yan “Jane” Jiang, the LTPP Team member managing this activity, LTPP InfoPave will replace LTPP Products Online. LTPP InfoPave will be a one-stop shop for LTPP data and other information. The new Web site is being designed to have a Google-like search feature which will allow users to search for data and other information related to that data (such as data collection guidelines, reports, and distress maps). It will not only include the annual Standard Data Release (SDR) for all of the LTPP test sections, it will also feature State/Province SDRs. Each State or Province will be able to customize the SDR for their region. In addition, ready-to-use datasets that target specific analyses will be available. These are just a few of the key changes that users will see in LTPP InfoPave, which is scheduled to make its public debut at next year’s TRB annual meeting. Bill King talks about using warm-mix in Louisiana. Although a little slow to react to this new technology, Louisiana is now an active participant in building warm-mix asphalt pavements, according to Materials Research Administrator Bill King. Since weather conditions in the State allow for a much longer paving season (about 11 months) compared to most parts of the country, Louisiana was not completely convinced of the benefits of building warm-mix asphalt pavements. However, after the initiation of the current ongoing research project, Louisiana has built and evaluated four warm-mix asphalt projects, each using a different technology. Unique to their research is the fact that they were able to utilize their mobile laboratory trailer for each construction project. Sampling and testing were conducted in accordance with current State specifications for a comparative evaluation. Louisiana utilized a suite of commonly used tests and some newer developmental tests to evaluate and compare the expected performance parameters, such as rutting, fatigue, and long-term durability of asphalt mixtures. King reported that all indications so far suggest warm-mix asphalt mixtures are expected to perform as well, if not better, than conventional mixtures. Also, higher recycled asphalt pavement content was beneficial in warm-mix asphalt mixtures. From this research, Louisiana has adopted a permissive specification allowing contractors to employ warm-mix technologies that are used on many of the State’s projects today. Another benefit of using warm-mix is that mix temperatures are lower, which is better for the environment because it reduces carbon dioxide emissions. In addition, contractors have reported about 15 percent savings in mix plant fuel usage compared to conventional mixes. Stephen Lee discusses implementing warm-mix in Ontario. A few years ago, the Ministry of Transportation of Ontario developed a strategic plan for its infrastructure system. Stephen Lee, who heads the Pavement and Foundation Office, said the plan had two objectives. The first was for Ontario to have the greenest roads in North America, and the second was for one quarter of the Ministry’s business to be done in an innovative way. Before Ontario could implement warm-mix asphalt technology, they had to first define it. So they adopted the definition used by the National Asphalt Pavement Association. The Province encountered many challenges implementing this new technology, from higher costs to uncertainties of performance in Ontario’s northern cold climate regions. Ontario has begun and will continue to monitor the performance of their warm-mix asphalt sections using laser and video technology to produce objective results of the pavement’s roughness and surface distresses. In spite of having to manage some of these risks, Ontario continued to move forward in advancing warm-mix asphalt technology. In 2011, 10 percent of their asphalt paving jobs used warm-mix technology and this percentage is expected to rise to 15 percent by 2013. Ontario found that warm-mix asphalt pavements complied with conventional standards and that the temperature for paving warm-mix sections was 10-30°C lower than for hot-mix asphalt sections. Also, the average compaction results for warm-mix asphalt were either equal or better than hot-mix asphalt. Similar to Louisiana, Ontario found that the carbon dioxide emissions were reduced compared to paving jobs that used hot-mix asphalt procedures. Another key advantage for Ontario implementing warm-mix technology is the longer paving season they now have to complete construction jobs. We are still faced with that age-old question, “What treatment do I apply to what road, and at what time?” This question has been asked by highway agencies for decades and continues to be a question that is not easy to answer. According to David Luhr, the State Pavement Management Engineer in Washington— where the network is mostly (87 percent) flexible pavements—they are still asking this question. Like many highway agencies today, Washington is faced with having to extend pavement life with limited resources, which is challenging to do. One effective approach that Washington took to address this question was to link the maintenance and pavement management system databases to each other. They allow these two systems to “talk” to each other and share information that will give those in the decision- making positions the most current information about the condition of the roadway. 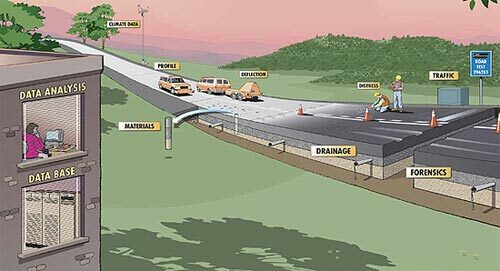 In 2012, the Washington State Department of Transportation (DOT) began establishing test sections with different maintenance treatments in order to evaluate the effectiveness of various pavement preservation methods. These test sections will be monitored over time and integrated with the maintenance data in the pavement management system to provide as much information as possible to decisionmakers as they prioritize pavement maintenance and rehabilitation projects with very limited resources. Shad Sargand smiles about the $3.67 million annual savings Ohio receives because of LTPP. 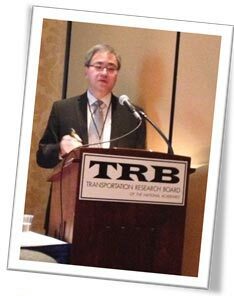 Dr. Shad Sargand of Ohio University has worked very closely over the years with the Ohio Department of Transportation evaluating and performing research at LTPP test sites under the direction of Roger Green who recently retired from the DOT and served as the LTPP State Coordinator. Since 1993, Ohio has been actively involved with LTPP in collecting data not only for the national program, but also for the State’s particular need and use. As a result of their active involvement, Ohio was able to develop a new approach for selecting bases which resulted in an annual savings of $3.67 million for the State. Evaluating the three and a half miles of asphalt and concrete test sections on the Strategic Highway Research Program (SHRP) Test Road has proved to be a very good training tool for State engineers. To determine causes of failure, forensic analyses were performed on test sections that failed prematurely. The LTPP Specific Pavement Study (SPS)-2 test sections in Ohio were used for the initial calibration of the new pavement design guide. Ohio resurfaced some of the original LTPP test sections with a warm-mix asphalt foaming treatment. These sections have the potential to be ideal candidates for LTPP’s new initiative to monitor these types of pavements, especially since the performance history before the treatment is already known. In addition, Ohio has been evaluating perpetual pavements. Dr. Sargand stated that each State should have a champion in DOT for the new warm-mix monitoring program to be successful. He emphasized that researchers must show results early and often to get people involved and keep them engaged. 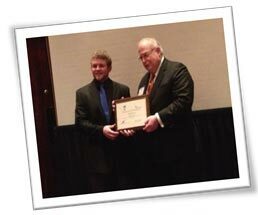 Daniel Franta receives 2012 Data Analysis Contest Award. Every year, LTPP and the American Society of Engineers (ASCE) partner to hold an international data analysis contest focusing on the use and application of LTPP data. As a culmination to this past year’s competition, Dr. C. Michael Walton, President of ASCE’s Transportation and Development Institute, presented an award to Daniel Franta, a graduate student at the University of Minnesota. Franta’s winning paper, “Classification of Features of Pavement Profiles Using Empirical Mode,” placed first in the newly created challenge theme category. The intent of this category, which changes each year, is to focus on different areas of ongoing LTPP research. Dr. Walton, who was involved in LTPP in the early years of the program, is glad to partner with LTPP to sponsor the contest so that students can stay involved in research and use the LTPP database. The contest guidelines for 2013 will be posted on the FHWA LTPP Web site in March. Chuck Schwartz talks about the LTPP climate study. In addition to the LTPP State Coordinators’ Meeting, LTPP also hosted a technical session to present the results from two recently completed traffic data analysis projects and early findings from an ongoing project focused on climate data that has the potential to impact the Mechanistic-Empirical Pavement Design Guide (MEPDG), now known as the AASHTOWare Pavement ME Design. New traffic loading defaults for the design guide were developed using the weigh-in-motion (WIM) data from the LTPP SPS Traffic Data Collection Pooled-Fund Study, TPF-5(004). Also, a software program called the LTPP Pavement Loading User Guide (LTPP-PLUG) was developed to provide guidance to agencies in developing axle load defaults and selecting defaults for the new design guide for sites where site-specific WIM data is limited or does not exist. A summary of these two projects was included in the Fall 2012 LTPP Newsletter. Similar to traffic data, climate data is another required input for the new design guide. While there is climate data for many LTPP sections, hourly climate data, which is needed as a design input for the new guide, is not available in the LTPP database. Therefore, other data sources with this detailed information were sought. One source that was discovered in this study is the Modern Era Retrospective-Analysis for Research and Applications (MERRA) data. This data set is based on detailed atmospheric observations from 1979 to present using the National Aeronautics and Space Administration (NASA) Goddard Earth Observation System Version 5 (GEOS-5). The MERRA model covers the entire globe and records about 4 million observations every 6 hours. The data is subject to extensive quality checks and a self-correcting algorithm re-examines data continually. Its coverage and depth of information has potential to provide pavement engineers with a new tool to use to model short- and long-term climate effects and can serve as a key input to the MEPGD. For more information or to get a copy of any of the presentations, contact the LTPP Customer Support Service Center at ltppinfo@dot.gov or (202) 493-3035. The TRB's Data Analysis Working Group (DAWG) conducted a forum on pavement performance data analysis in Washington, DC, on Saturday, January 12, 2013, immediately prior to the opening of TRB’s 92nd Annual Meeting. More than 65 attendees participated in the forum which consisted of eight presentations, each of which was followed by a lively discussion. The topics addressed included asset management, asphalt layer temperature profiles, smoothness specification, performance evaluation, the Texas pay adjustment system, classification of profile features, rut evaluation, and skid resistance. 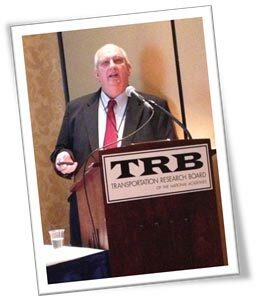 The forum is sponsored by FHWA’s Office of Infrastructure Research and Development as part of its support of the TRB LTPP Committee and its expert task group. The DAWG is a standing committee of the National Academies whose sole function is to conduct international forums for the discussion of methods of analysis of pavement performance data. Presentations at these forums address the technical interests of professionals engaged in pavement research, design, maintenance, and rehabilitation, who are interested in collecting, processing, and analyzing such data, and in developing insights into the behavior of pavements. Presentations focus on work-in-progress on techniques for extracting and analyzing data, and early results of recent applications of these techniques. Topics such as model building, sensitivity analysis, and transfer functions linking structural response to distress are especially popular. The requirements for acceptance of abstracts and the format of the forum's proceedings are intended to encourage the presentation of recent (up-to-the-minute) work as well as open discussion among presenters and attendees. DAWG forums are held twice each year, in January, immediately preceding the TRB Annual Meeting in Washington, DC, and again about midyear. In keeping with DAWG's international character, 11 of the 21 members on the Steering Committee are non-U.S. nationals, the chair of the committee is rotated every 3 years between U.S. and non-U.S. nationals, and the midyear forum is held in conjunction with a major international highway pavement conference, usually in another country. The LTPP program office would like to thank the LTPP Committee for their leadership and continued support of the LTPP sessions held during TRB week. Your strong presence at the Coordinators’ meeting was remarkable. 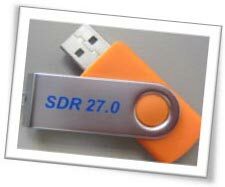 SDR 27.0 is Officially Released! Yan Jiang officially releases SDR 27.0 to Jorge Pagán-Ortiz. The LTPP Customer Support Service Center provides access to the world’s largest pavement performance database. 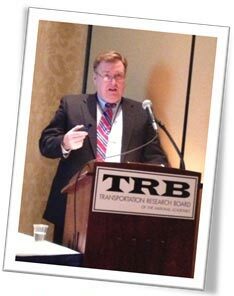 LTPP Standard Data Release 27.0 was officially released and distributed at the 2013 TRB Annual Meeting. This is the first year that LTPP has distributed only a thumb drive version of the database to its users. 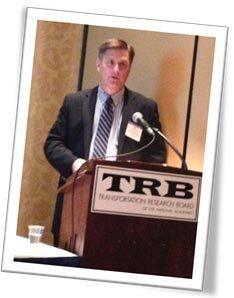 If you were not at TRB and would like to receive a copy of an updated and expanded dataset, reinterpretedOhio dynamic load response data, a new load transfer efficiency computed parameter, and beta release of compiled tables, please contact the LTPP Customer Support Service Center at ltppinfo@dot.gov or (202) 493-3035. Below are the scheduled Webinars that LTPP will host between now and June. The Webinars are typically the first Thursday of the month from 2 to 3 p.m. (Eastern Standard Time). Separate Webinar announcements with more detail will be sent for each session, so be sure to register for the sessions that interest you.